The issue of skin colour discrimination is a serious problem in the make-believe industry not just Ghana or Africa but the world over, mostly against Africa actors. The sensitive topic came up for discussion during the African Women in Film Forum held at Alliance Francaise in Accra on Monday April 4, 2016. 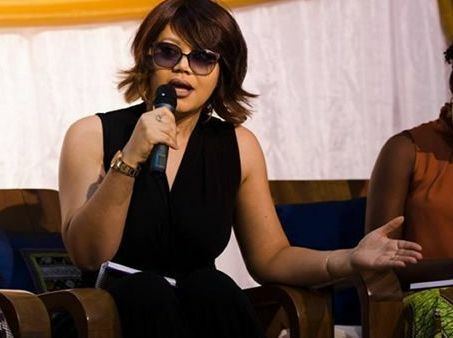 Dark skinned Ghanaian actress Yvonne Okoro and light-skinned actress Nadia Buari have revealed that they were both denied movie roles because of the colour of their skin. “I’m light-skinned and it is obvious. I get asked a lot of times if I feel being light-skinned contributed to the success of me being an established actress. No! It is wrong and I will tell you why; because I feel like you get to a certain place obviously because God permitted it. He put you there and because you are determined and because you have the talent. I am not trying to blow my horn but I feel like I’ve worked so hard to get to where I am…I have had a lot of roles where I wasn’t good enough because I was too light-skinned. For instance a certain movie producer called me and said she wanted me to be part of her movie …and I felt I really wanted to be part of her movie. But the one thing she asked me was, ‘I think you are too light-skinned; is there a way you can tan?’ And I was like, ‘Wait a minute. What do you mean [by] tan?’ And she was like, ‘Go in the sun and get brown.’ And I said to her, ‘I don’t know if you have seen me before but I’m almost like an Obroni (white).’ And she said, ‘Well like I wanted you to play a sister to other dark characters…’ And I wasn’t favoured. I don’t think light-skinned actresses are favoured because they are light-skinned. I feel like you have to possess talent. You need to have the drive and you need to have God on your side. You need to earn that and not really about you being light-skinned or any complexion. And please, it is wrong,” Nadia said.